Criminal Justice exposed the erosion of civil liberties by the 1994 Criminal Justice Act and highlighted the resistance by a wide range of groups, which were adversely affected by it. The research team interviewed around 80 people affected by the legislation, ranging from Anti-M11 link road campaigners, disabled activists and “new-age” travellers through to gypsies, squatters and “Footballers against the CJA”. 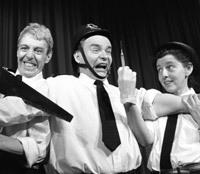 The show used satire to illustrate the wider legal and political implications of the Act, intercut with song and recorded actuality portraying the experiences of groups affected by the legislation. A CD and cassette of actuality, music and songs – ranging from Irish jigs to Ivory Coast Zouglou – from Redemption Song and Criminal Justice are available from the Banner office.